This 4.8 kilowatt photovoltaic system is installed on the new Jane Snyder Trail Center as part of the Antelope Valley Union Plaza project. 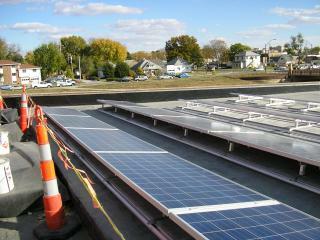 The modules are secured to the flat roof with a pre-engineered ballasted racking system. The system is a grid-tie system with performance readings available for public view via a wireless remote display. This project is funded via the American Recovery and Reinvestment Act.